Plant: Trailing perennial subshrub; the stems flexuous, stellate-pubescent and usually also with long simple hairs Leaves: ovate, crenate, up to 7 cm long (progressively reduced upward) Flowers: solitary in leaf axils, on slender, recurved pedicels; calyx 4-7 mm long, reflexed in fruit; petals 6-11 mm long; staminal column glabrous, 2-2.5 mm long; styles 10-12 Fruit: FRUITS schizocarpic, oblate to hemispheric, inflated, hirsute, 1.5-2 cm diameter; mericarps 10-12, dorsally dehiscent. SEEDS 1.7 mm long, minutely scabridulous Misc: Dry slopes, canyons, and roadsides; up to 900 m (3000 ft), occasionally higher; flowering throughout the year References: P. Fryxell - Malvaceae - JANAS 27:222-236. J.C. Hickman, ed. The Jepson Manual. Kearney and Peebles. 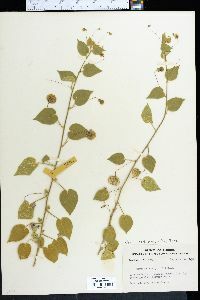 Arizona Flora.ASU specimens. REFERENCES: Fryxell, Paul A. 1994. Malvaceae. J. Ariz. - Nev. Acad. Sci. Volume 27(2), 222-236. Duration: Annual Nativity: Native Lifeform: Subshrub General: Herbaceous or subshrubby annuals to perennials, stems to 1 m long, decumbent or trailing and flexuous, herbage stellate-pubescent and usually also with long simple hairs. Leaves: Alternate, ovate, 1-7 cm long, bases cordate, margins crenate, often with rounded teeth, lower blades petioled, upper blades becoming progressively reduced and short-petiolate or sessile distally, stipules inconspicuous and dehiscent. Flowers: Creamy white to light peach with yellow throats, petals 5, 6-11 mm long, calyx 4-7 mm long with lanceolate lobes, these becoming reflexed in fruit, staminal column glabrous, 2-2.5 mm long, anthers golden-yellow, styles 10-12, ovaries superior, flowers borne solitary in leaf axils on slender, recurved pedicels. Fruits: Oblate to hemispheric, nodding, inflated schizocarps, 1.5-2 cm diameter, with 10-12 segments (mericarps) generally longer than wide and with rounded tops, dorsally dehiscent and papery, silvery-shiny inside, outer surfaces short-bristly. Seeds 3 per meric Ecology: Found on dry slopes, canyons, roadsides, and in desert-scrub communities, to 3,500 ft (1067 m); flowering year-round or August-September. Distribution: Arizona, California, Florida, New Mexico, Texas. Notes: This species has cream-colored flowers with yellow throats, anthers and stamens, 5 petals with rounded tips and visible venation on their surfaces, and heart-shaped leaves with round-toothed margins, the leaf surfaces dark green above and lighter in color below. The fruits resemble pincushions, with many segments and small, reflexed, star-shaped, subtending bracts with pointed tips. Look for this species in Arizona in Pinal, Maricopa, Yuma, and Pima counties. Ethnobotany: Unknown. Synonyms: Abutilon crispum, Bogenhardia crispa, Gayoides crispum Editor: LCrumbacher2012 Etymology: Herissantia is named after Louis Antoine Prosper H_rissant (1745-1769), French physician, naturalist and poet, and crispa comes from Latin meaning "curled or wavy" in reference to the leaves.